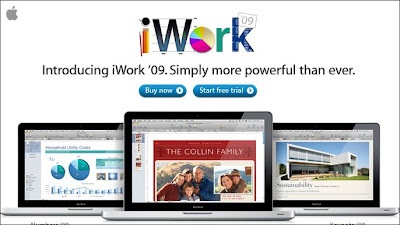 Dominichulinda | A Random Blog(ger): Apple: iWork09!! Now the iWork suite makes it even easier to create great-looking documents, spreadsheets, and presentations. Tap into full-screen view in Pages, simple new ways to create powerful formulas and charts in Numbers, new animations like Magic Move in Keynote, and more. And share your work quickly and easily with anyone on a Mac or a PC. Focus on your work like never before. With 40 new Apple-designed templates and features like full-screen view and Outline mode, Pages '09 lets you focus on your writing, organize your thoughts, and deliver impressive results. Creating the perfect brochure, report, or resume is easier than ever with Apple's powerful word processing and page layout application. Formulas and advanced charts made simpler. With easy formula writing, new charting options, and table categories, creating a spreadsheet has never been so intuitive. Numbers '09 adds power without sacrificing ease of use. It offers 30 Apple-designed templates to help you get started with everything from tracking your retirement savings to planning a party to recording your workouts. Presenting new animations, transitions, and effects. Now creating a showstopping presentation is surprisingly simple. Exciting new effects make your text and objects leap off the slide. Easily create sophisticated animations across consecutive slides with Magic Move. And make charts come alive with 3D animations.